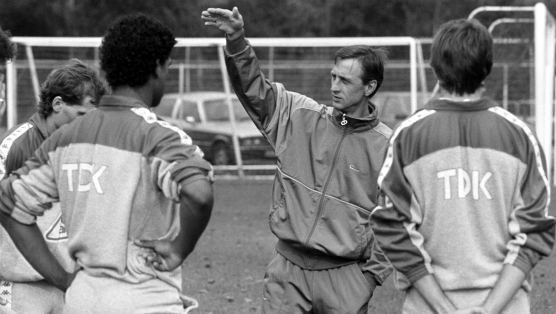 Johan Cruyff has a very special way of looking at soccer, and an equally distinctive way of talking about it. It was Cruyff’s vision on the field that made him one of the greatest players of all time—seeing passes that no one else could see, but also being aware of the ebb and flow of a game and knowing how to control it. So when Cruyff talks, people listen. A Cruyff quote grabs your attention not just for its insight, but also for the supreme certainty with which he delivers it. He may seem arrogant, but that’s only because he thinks he knows everything. The 25 quotes below, taken from throughout Cruyff’s days as a player, then coach, then pundit, offer a window into the way Cruyff sees soccer—and they just might change the way you see the game. 1. Technique is not being able to juggle a ball 1000 times. Anyone can do that by practicing. Then you can work in the circus. Technique is passing the ball with one touch, with the right speed, at the right foot of your team mate. 2. Someone who has juggled the ball in the air during a game, after which four defenders of the opponent get the time to run back, that’s the player people think is great. I say he has to go to a circus. 3. Choose the best player for every position, and you’ll end up not with a strong XI, but with 11 strong 1’s. 4. In my teams, the goalie is the first attacker, and the striker the first defender. 5. Why couldn’t you beat a richer club? I’ve never seen a bag of money score a goal. 6. I always threw the ball in, because then if I got the ball back, I was the only player unmarked. 7. I’m ex-player, ex-technical director, ex-coach, ex-manager, ex-honorary president. A nice list that once again shows that everything comes to an end. 8. Players that aren’t true leaders but try to be, always bash other players after a mistake. True leaders on the pitch already assume others will make mistakes. 9. What is speed? The sports press often confuses speed with insight. See, if I start running slightly earlier than someone else, I seem faster. 10. There’s only one moment in which you can arrive in time. If you’re not there, you’re either too early or too late. 11. Before I make a mistake, I don’t make that mistake. 12. When you play a match, it is statistically proven that players actually have the ball 3 minutes on average … So, the most important thing is: what do you do during those 87 minutes when you do not have the ball. That is what determines wether you’re a good player or not. 13. After you’ve won something, you’re no longer 100 percent, but 90 percent. It’s like a bottle of carbonated water where the cap is removed for a short while. Afterwards there’s a little less gas inside. 14. There is only one ball, so you need to have it. 15. I’m not religious. In Spain all 22 players make the sign of the cross before they enter the pitch. If it works all matches must therefore end in a draw. 16. We must make sure their worst players get the ball the most. You’ll get it back in no time. 17. If you have the ball you must make the field as big as possible, and if you don’t have the ball you must make it as small as possible. 18. Every professional golfer has a seperate coach for his drives, for approaches, for putting. In football we have one coach for 15 players. This is absurd. 19. Surviving the first round is never my aim. Ideally, I’d be in one group with Brazil, Argentina and Germany. Then I’d have lost two rivals after the first round. That’s how I think. Idealisitic. 20. Players today can only shoot with their laces. I could shoot with the inside, laces, and outside of both feet. In other words, I was six times better than today’s players. 21. Quality without results is pointless. Results without quality is boring. 22. There are very few players who know what to do when they’re not marked. So sometimes you tell a player: that attacker is very good, but don’t mark him. 23. I find it terrible when talents are rejected based on computer stats. Based on the criteria at Ajax now I would have been rejected. When I was 15, I couldn’t kick a ball 15 meters with my left and maybe 20 with my right. My qualities technique and vision, are not detectable by a computer. 24. Playing football is very simple, but playing simple football is the hardest thing there is. 25. If I wanted you to understand it, I would have explained it better.